It took years to make the biggest fight in boxing history a reality and less than 60 seconds for the tickets to sell out. 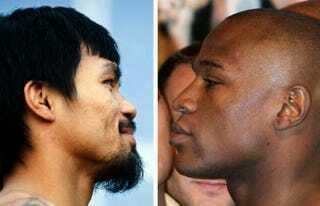 Tickets went on sale for the Floyd Mayweather vs. Manny Pacquiao bout at the MGM Grand in Las Vegas on May 2 around 3 p.m. EDT on Thursday and were sold out faster than you could type “Pacquaio” correctly without using Google. Although there are differing reports as to how many tickets were actually made available to the public, what isn’t up for debate is how fast those tickets went. The ticket prices ranged anywhere from $1,500 up to $7,500, according to the Los Angeles Times. The Sporting News notes that the MGM Grand can house some 16,800 participants and estimates that as few as 500 to 1,000 tickets were released to the public. Many believe that both camps kept numerous tickets to give away as gifts or to sell at a higher price, with some tickets expected to fetch as much as $200,000, according to the Daily Mail.